On my current genealogy trip to Oklahoma and Arkansas I am struck by the number of accidental discoveries that are enhancing my efforts at solving the mysteries of my ancestors. When I came to Oklahoma on my first genealogy trip I was still missing so many basic details in my family’s lineage that the majority of the trip was about filling in the blank spots on the family tree; dates, middle names and first wives or husbands that I never knew existed. This trip, while I am still filling in a few holes, my main goal is to discover the context and subtler details of my ancestors’ lives. No longer satisfied with knowing in what city and state they were born or lived, I want to know exactly what acreage they inhabited. When they moved from Arkansas to Oklahoma, why did they make the move? Where did they go to school, to church? I find that my hunger for details is insatiable. And I am finding that because I know so much more about my family that I am more in tune with leads to follow that might provide answers. What has surprised me this trip is the casual decision made to say a few words to someone, or open a book that happens to be in front of me, that has led to me finding some missing details that I thought I might never find. One of these accidental discoveries occurred two weeks ago in Wagoner, Oklahoma. It was a day that I had planned to do some exploring in another county with my second cousin, John. At the last minute he had some work obligations that could not be put off. Rather than explore without him I decided to wrap up a few local details and reschedule with John for the next day. One of the items on my list was to go to the Wagoner County Court House to see if I could find a follow-up document to some papers that I had found on my last trip regarding the sale of my grandmother’s Dawes Allotment land in Wagoner County. While standing at the window in the County Clerk’s office waiting to talk with someone, I turned my head and noticed a very large and very old log book of some kind. It was at least two feet by three feet and four to six inches thick. There were lettered tabs on the right hand edge. I opened the cover and it said something like Probates, 1907-1911. I flipped to “W” for West, my grandmother’s married name and saw nothing. Then I flipped to “C” for Crittenden my grandmother’s maiden name and the first two entries were for Moses Crittenden, her father, and Isaac Crittenden, her brother. Next to their names were some dates and docket numbers. I wrote them down and when it was my turn to be waited on I asked if this book was just for display or did they have access to these particular old documents. The answer was that the documents were in storage in another facility and that if I returned in a couple of days they would have copies of them for me. When I returned three days later I was told that they could not find the papers for Moses but that they had an 18 page document regarding the probate listed under Isaac Crittenden. I knew Isaac did not die until many years after the date of this document so was very curious what this probate document was regarding. What I found was that on April 1, 1907, shortly after Oklahoma became a state, Margaret Crittenden, Isaac’s mother, had filed to be Isaac’s, then still a minor, guardian over the possessions that he had inherited from his father, Moses, in 1999 and over the Dawes land that Isaac had been allotted. Included in this document was a complete legal description of Isaac’s allotment land. At the end of this legal description was the answer to a question I had been asking for the past five years. I knew from census data that my grandmother lived with her mother outside of Wagoner in Township 16 in 1900 and probably for some time before that. I had descriptions of my grandmother’s, and her brother Isaac’s, Dawes allotment land in Township 16. On my last trip I had gone and stood on that land and wondered if any of the allotment land that they received was the land on which they had lived. And now, this amazing accidental discovery answered a question to which I thought I would never know the answer. At the end of the description of Isaac’s allotment land in the probate papers is the following sentence. “All 90 acres being Cherokee land with valuable buildings thereon being part of the old ‘M.Crittenden Homestead’. Estimated that 25 acres are in cultivation. This land is part prairie and part timber. I could have stood at some other window in the clerk’s office. One that did not have an old probate log sitting behind it. I could have not turned around and been curious enough to open it. This accidental discovery could so easily have never been made. But it was. And now I know exactly where my grandmother lived from the late 1890s until she married my grandfather in 1903. Every day of this trip I feel a little closer to my grandmother and to the amazing life that she lead. In a post last month I mentioned meeting a Crittenden cousin through my blog site. That cousin is the great, great granddaughter of my great grandfather. What a surprise it was to receive an email from a reader who had seen my great grandfather Moses Crittenden’s name when reading the About Me tab on my blog. She told me that Moses was her great, great grandfather and that she had been researching that branch of her family tree for years. I had been posting to my blog for a couple of weeks and only a few readers had found the site at that point. It still amazes me that one of the first readers of my blog would end up being a cousin that I did not know existed. She is my second cousin once removed as her father and I share a great grandparent, Moses Crittenden. This connection is especially meaningful to me. In my blog “Finding the Unexpected”, I talked about a son that my great grandfather had when in a relationship with Emily Crittenden, who was his brother-in-law’s slave. The relationship between Cherokee settlers and their slaves is a complex one. It is hard for me to accept that any of my ancestors had slaves living in their household. I know for some of these connections there were loving relationships that were defined by the expectations and culture of the times and not by the truths of the relationship itself. For others they were relationships based on power and dominance. I have no context for the relationship between my great grandfather and Emily Crittenden. I do know that their son Anthony Crittenden was my grandmother’s half-brother and my mother’s uncle. I knew less about Anthony than my grandmother’s other siblings and half-siblings because the only record I could find was his grave marker in Warner, Oklahoma. I had already decided to visit that cemetery when in Oklahoma next month and see if I could find information about his descendants and his life. My connection with his great granddaughter has provided information about Anthony’s descendants that I thought I would be searching for over the next several years. 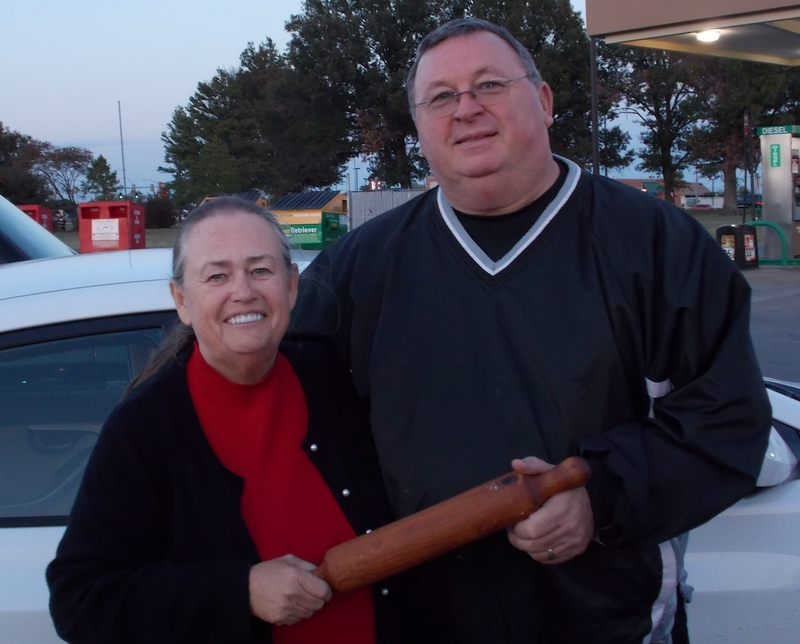 Most of Anthony’s family has lived in Warner Oklahoma for the past several generations. Many are buried in the same cemetery with Anthony. My newly found relative and her father, my second cousin, are currently living in Warner and I will meet them next month. The greatest treasures to me in my online searches are photographs. I now have two additional photos of Anthony Crittenden, and one of his mother Emily Crittenden. My cousin emailed photos of the photos in her album. I will scan copies of the originals while in Oklahoma and add them to my online family tree at Ancestry. I have mentioned before that my mother’s father left the family when she was about two years old. Trying to find out more about him and his family was part of my genealogy quest as mother knew nothing but his first and last name. My mother had about a half dozen photos of her parents early life which she passed on to me when I started researching our history. My goal was to find out more about who my grandfather was and to research my grandmother’s Cherokee ancestry for my mother’s 90th birthday. While searching on ancestry.com I came across a photo someone captioned as Grandma Brewer on Ancestry. Grandma Brewer’s parents appeared to be the same as my grandfather’s parents. I wrote the person who posted the photo and she wrote back saying I should call someone named John from whom she got the photo and provided me with his phone number. I looked up the area code location and saw that he lived in the area where my grandmother was raised and where she lived for a while with my grandfather. Something told me this was going to be a big breakthrough and I anxiously dialed the number. Through this call I met my cousin John who is the grandson of my grandfather’s sister. We formed an instant connection and have exchanged hundreds of emails in the past three years. Last October I went to Tahlequah Oklahoma to continue research on my grandmother’s Cherokee heritage and met with John on the first day of my trip. During my time in Oklahoma John’s cousin (and mine) hosted a huge family barbecue where I met more than a dozen relatives I never knew I had. They shared many family stories/legends about my grandfather, known to them as Uncle Jim. Most had only seen him once or twice but had numerous family tales as he was a somewhat notorious character. 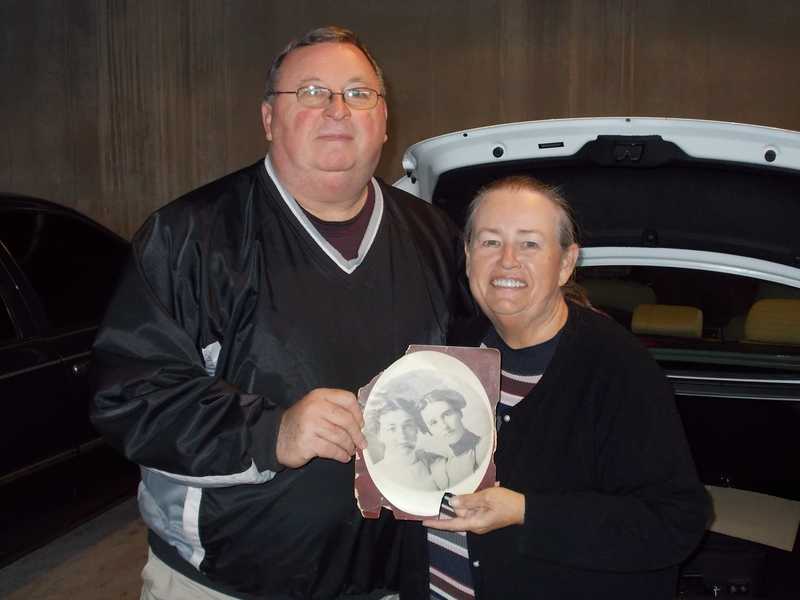 The info I have found on my grandmother and grandfather is a source for many future stories. However, I wanted to share two small tidbits that are were so meaningful to both my cousin John and me. In our email conversations John told me that he had inherited a rolling pin from his grandmother when she died. It is the rolling pin she used to make numerous pies and cookies at large family dinners which were held every Sunday until she died and attended by all of John’s aunts, uncles and cousins. On this rolling pin an aunt had tied a note, “carved for your grandma on her 10th birthday by her then 15 year old brother Jim, her favorite brother”. Jim was my grandfather. The second very emotional connection was that John asked if he could see a photo of my grandfather when he was young. I said I had only a few photos from that time that I had not looked at in a while but I would go through them and see what I could find. In those photos was an old oval photo of my grandmother with another young woman. On the back my mother had written, “mother with Aunt Sally”. This photo was of my grandmother and John’s grandmother as very young women. They would have been sisters in law. I scanned and sent the photo to John who called me in tears saying he had no photos of his grandmother as a young woman. This family journey has been astounding and I have found amazing things. Including the fact that my grandmother, who we were always told had “some Cherokee blood”, was raised as a Cherokee and never stepped foot out of Indian Territory until she married my grandfather in 1903. Her father was an Old Settler who migrated to Arkansas and then Oklahoma under the New Echota treaty. The facts I have gathered are interesting. However, what is most meaningful is the connections that I am making. I saw a cartoon on Facebook a while back. The caption was “Home is Where Your Second Cousin Thrice Removed Lives”. After my trip to Oklahoma, and meeting John and other extended family members, a piece of my heart is there. I am looking forward to returning in a couple of months and making more memories. Watch in the next couple of weeks for a post about a cousin I just met through my blog site. She is one of my Crittenden cousins and I cannot wait to meet her in person. About a year into my research on Moses Crittenden I had a good overview of the basics. He was born in Georgia in 1825. He died in Wagoner, Oklahoma in 1899. He had been married to Eda Quinton and together they had eight children. After Eda died Moses married Margaret Howell, my great grandmother, and they had nine children, including my grandmother Eliza Jane Crittenden. The basic information makes a great foundation for research. For me, what I am always searching for is the story of their lives. What is the context of the time in which they lived? Who were they as people? And each photo that I find is like a treasure. One lesson I have learned in my years of family research is that when you think you have the facts part completed, there is usually a surprise around the corner. Previous marriages and families that you never knew about or finding that the family that raised the person, while having the same last name, was actually their aunt and uncle and not their parents, are a few examples. While at the Cherokee Family Research Center within the Cherokee Heritage Center at Tahlequah, Oklahoma I came across a family genealogy on the Crittendens. It had been researched a few decades earlier and was a great find for looking into extended family and family connections. There are many branches of the Crittendens so I was delighted to find a detailed chronology of my grandfather Moses’ life. Included were details on the Old Settler Roll, the 1880 Cherokee Roll and other information that I had not yet located. Met Emily Crittenden b. 1838 I.T. d. 1908 OK. I was perplexed about why the author of the document would think it worth mentioning that in 1853 Moses met his relative Emily. Then I read the footnote stating that Emily Crittenden was a slave and belonged to Elijah Phillips and Sidney (Moses’ sister) Crittenden Phillips. The only other information was that she was buried in Proctor Cemetery in Adair County, Oklahoma. Those of you less naïve than me may have already figured out that “met” was the language of the times for “had sexual relations with”. It was not until I read another note about the birth of Anthony Crittenden that I figured this out. 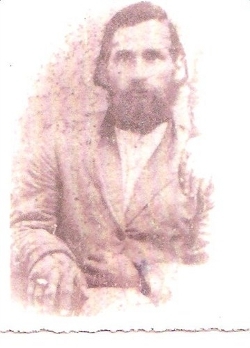 Anthony Crittenden (son of Moses and Emily) was born in Polk County, Arkansas about 1854 and died April 9, 1909. He is buried at Bennett Cemetery in Warner, Oklahoma. 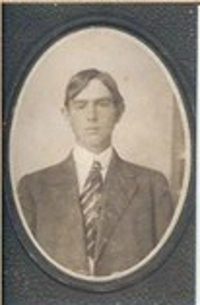 I was very lucky to find a photo of Anthony in a family tree on Ancestry.com He is one of only three Crittendens from this generation of whom I have a photo. He applied as Cherokee by blood before the Dawes commission but was denied since he had been a slave of Elijah Phillips and was enrolled as freedman through his mother Emily (Crittenden) Weaver. I am as interested in finding out more about Anthony and his descendants as I am all of my grandmother’s siblings and half siblings. Anthony and Emily are two of the people I hope to find out more about on my next trip to Oklahoma. I will definitely pay my respects to both by visiting the cemeteries where they are buried. Finding another great uncle that I did not know that I had is but one of many surprises I have found on this journey. What are some of the surprises that you have encountered?